While digging around the web to find something to put in this weeks post, I came upon the story of Bert Grant. Grant is credited with starting the first post-prohibition brewpub in the United States, back in 1982. Born in Scotland, Grant spent his formative years in Canada where he stared working in a brewery at the age of 16. Arriving in Yakima in 1967, Grant helped design and build a pelletizing operation for hops, before he finally opened his own brewery 15 years later. This pelletizing process was important for this region, and the craft beer industry. Prior to the development of hops pellets, brewers had to rely on bales of whole hops. These bales were large and susceptible to spoilage. With the advent of the pellet, brewers could more easily store the hops, and had their brewing opportunities opened with the introduction of mixed hops pellets. Washington presents as a craft beer state. From its Yakima valley, which comprising 75% of the total hops acreage in the U.S. and is one of the most productive hops production regions in the world, to its ranking of 8th nationally for breweries per capita. However when it came to locating beer from Washington, it was much harder than I expected. Because of that, we only had two different styles of beer to try for this week. The first beer of the evening was an Imperial IPA from Pyramid brewing called Outburst. Imperial, now a vague term meant to imply a stronger than normal beer, was originally intended for beer brewed for the crown heads of Europe. This beer, with its dark, golden honey color emitted a very sweet smell that carried over into its taste. In fact, it was one of the more sweeter IPAs we had this year. The next, and final beer we cracked up was a barley wine. 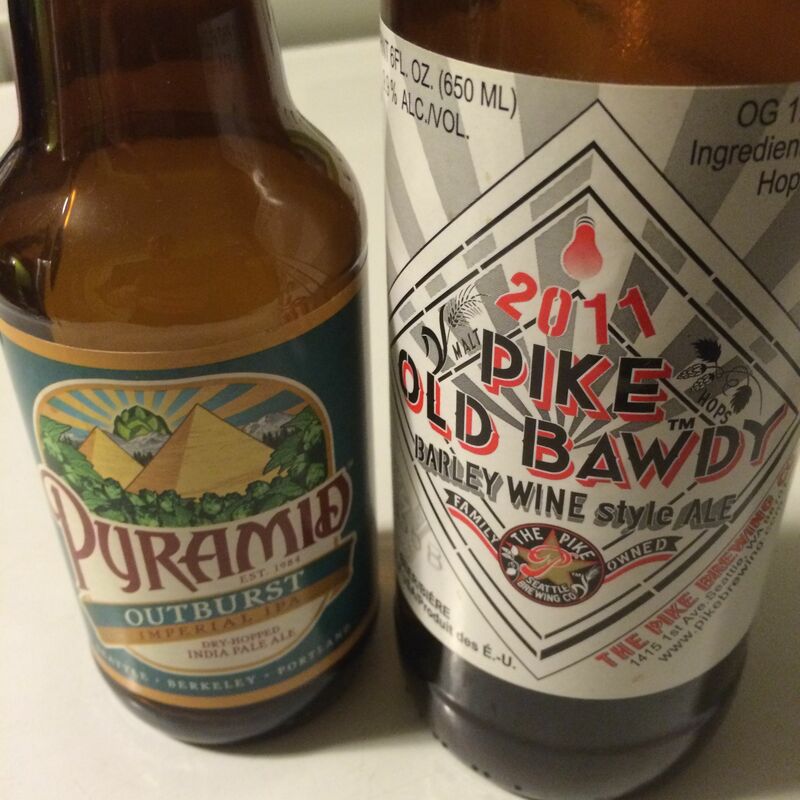 Known as the strongest of beers, barley wines are often 10% ABV and higher, and the one we had, Pike Old Bawdy, fell right on the mark with an ABV of 10%. With its Dark Red color, this beer was imposing. But the smell was even sweeter than the Outburst. With its thick mouth feel and sweet flavors, this beer was not something you would sit down and drink a glass of. It was a beer that would better complement a nice dessert. With only two samples, we were presented with a really sweet introduction to the craft beer of Washington state. Given its strong history and importance to the brewing industry, getting the chance to try some beer from Washington was a fun experience. Thanks for reading. Next post is Idaho.